One such person is Mimsy. We set out for her maiden mountain bike ride. Having met Tony Cancio of Sabak Sports and Adventure, I was assured of a dirt-worthy hardtail (bikes with front suspension only) rental for Mimsy at his shop in Sta. Rosa, Laguna. There is also a trail system within the area where hammerheads gather 4x a week for some dirt thrashing. A schedule was set. 2 riders, Erich Lingad and Richard Ng were our good Samaritans who patiently gave us the hand-holding on the beginner trails. The other riders went ahead to do the more advanced trails. Anyone unfamiliar with the terrain will get lost. It wasn't so much a mountain biking trail but a series of paved roads, open dirt roads and foot paths that connect barangays and barrios to make a trail system. 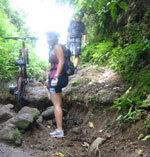 There is no mountain bike-specific trail system yet in the country. There was no bad seat at the Sabak shop. High-zoot bikes like Intense, Ellsworth, Santa Cruz were littered all over. Even in Canada, as a dollar earner, I couldn't get close to those bikes. No airs from the riders either...just a fun group having a great time on the trails. I hope to do some serious riding with them sometime. Interestingly, the riders would greet the locals "Good morning" as a polite alternative to blowing a horn or whistle. The locals have gotten so used to it, the entire barrio kids would even initiate it, some adults, with tongue-in-cheek. It was amusing, but after a while, it got old. If I have one wish for mountain biking here, its having an mtb resort with mtb-designed trails - beginner, intermediate and advance. This has caught on in North America and Europe. The ski resort owners got smart. Instead of closing down the ski resorts during summer, they opened it up for mountain biking. It took off like crazy. It doesn't take much. 10 hectares of sloping terrain is plenty. It's not capital intensive either - just groomed trails, a shower facility, a bike wash and eats. So far, there's none despite the growing popularity of the sport. With guys sporting P200,000 bikes and riding on wide-open fire roads and foot paths, it's like buying a Porsche and flooring it only along the 4 km Skyway stretch above the South SuperHighway...mtb blue balls, if you ask me. (24 Feb 2006) I had a great ride at SABAK trails in Sta. Rosa, Laguna to Silang, Cavite, Philippines on my Norco EXC bike last feb. 12 and feb. 19, 2006. I cant explain the excitement especially when we rode thru bukaka and duck trails haha!! Plus all the downhill rides thru Upak Trail!! Loved it!! The locals were nice with their "good morning" greetings. Cant wait to ride again this Sunday.